Obtaining a complete genetic profile for wildlife and plant research or medical research is often complicated by overlapping marker ranges and/or incompatible chemistries; making it necessary to amplify the same samples multiple times using different sets of markers or locus specific primers. Traditionally, researchers export the genotyping results from several multiplexes into a spread sheet and manually combine allele calls for each individual. GeneMarker® software is user-friendly genotyping software that automates this process with data from ABI PRISM®, Beckman CEQ™ or MegaBACE™ genetic analyzers. This merged report may be saved as a genome-wide genotype, or imported into other GeneMarker software applications, such as, Clustering Analysis (automated dendrograms) or Relationship Testing and Kinship Analysis; improving the robustness of these analyses by including information from a greater number of markers. The Merge Projects tool allows researchers to conveniently combine the results of two or more GeneMarker software projects (each project using a panel containing a unique set of markers or loci) into a single, comprehensive report. This report represents a single view of multiplexes (a super panel) of markers/loci from the individual projects, providing a complete genotype for each sample. Three different multiplexes were used to amplify 30 DNA samples. Each multiplex contained primers for 4 or 5 independently assorting loci. 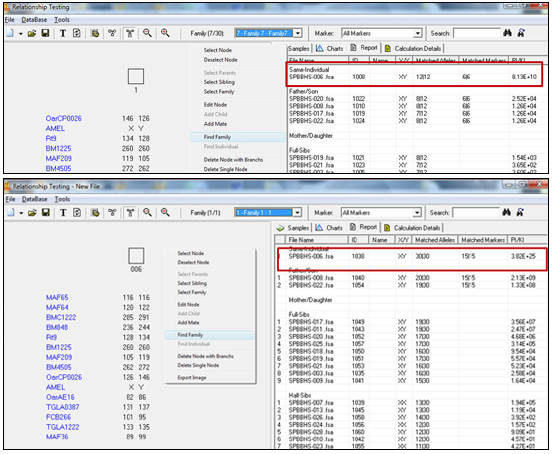 The merge project tool in GeneMarker software provided a single genotype for each individual with 14 markers. Allele drop out is indicated by **. Bin Table for further analysis using clustering algorithms for phylogeny. Comparison of a database search using the single multiplex results (5 independently assorting loci - upper figure) and the combined genotype (14 independently assorting loci - lower figure). The same file that had a 1/8.36 x10 to the 10th probability that there would be another random individual in that population with the same genotype when 5 loci were used now has further confidence that this is not a second individual as the LR is 1/3.82 x 10 to the 25 when 14 loci are used in the IBD calculations. The additional loci have also refined the potential Father/Son files from four to two. Information from the additional loci of the merged project provides a more informative dendrogram. 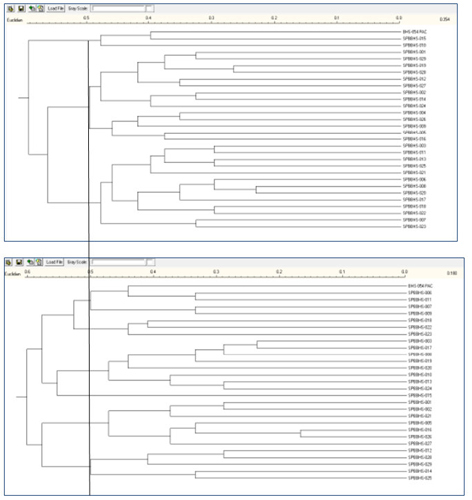 Comparing the two dendrograms below there are three branches distinguished in the upper (5 loci) diagram and 8 for the same region of the dendrogram that utilized the 14 loci.